Sometimes when we aren’t exactly feeling our best or things seem to be going wrong, the quickest way to get us out of a funk is to either do something nice for someone else or be grateful for what we have. As with any of our self-care practices, we should make them a habit and not wait until we are running on empty. 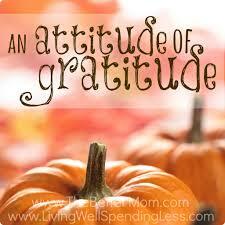 Practicing an “attitude of gratitude” is simple and powerful. Keep a list of what you are grateful for in an “official” gratitude journal or just jot down thoughts as they come to you in your planner margin. It doesn’t have to be a big production. Keep it simple and just start where you are. The action of reviewing the day and writing down things you are grateful for reminds you of the positive things in your life. Practicing an “attitude of gratitude” enables you to be more satisfied with your life because you are focusing more on what you appreciate and what’s good. It’s a simple action and it makes you happy. When you are happy good things happen. So grab your journal, a napkin or write on the palm of your hand and make a list of five (5) things you are grateful for and don’t feel like you have to stop there. Keep on going. I challenge you to write five (things) every day for the rest of October. Hey..if I can write a blog every day..you can definitely jot down five things you are grateful for in your life. I’ll share my mini-list tomorrow. Post a few of yours in the comments section and share your happiness with the rest of us.